Five presidential candidates in the May 21, 2010 Chicago Teacher Union election fired shots at each other while touting their qualifications to lead the CTU at the candidates forum at the CTU House of Delegates on Wednesday. The debate, which followed the brief April 2010 House of Delegates meeting, was moderated by Roosevelt University Professor Paul Green. Green had been selected so the debate would be independently moderated. Everyone who witnessed the debate agreed that Green had done that job. The format resembled many political debates, with each of the candidates standing at a podium in front of the more than 500 delegates who attended the meeting on the rainy evening. Chicago Teachers Union delegate (Gage Park High School) Deborah Lynch attended most of the 14 hearings on the 2010 school closings held at CPS headquarters between January 28, 2010, and February 10, 2010. Lynch is the CTU presidential candidate on the slate of the PACT (Pro Active Chicago Teachers and school employees) caucus. 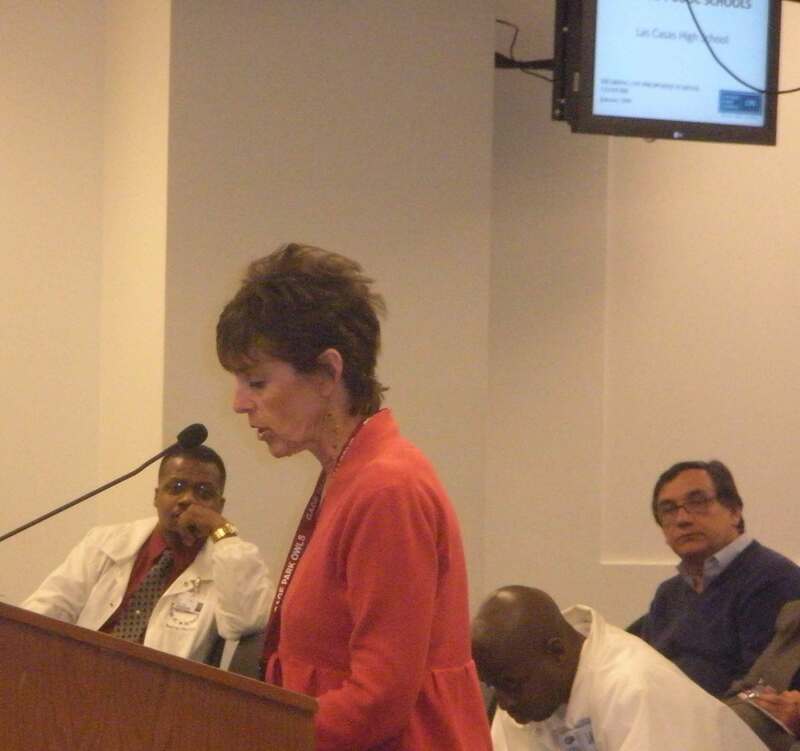 Above, Lynch is speaking in opposition to the closing of Las Casas Occupational High School, a school serving special needs students, on the night of January 29, 2010 at a hearing at CPS headquarters. Substance photo by George N. Schmidt.The order in which the candidates got to speak was determined by a drawing. The same order, union officials said, would be followed in assigning ballot position for the voting on May 21. Former CTU president Debbie Lynch from PACT, former CTU field rep Ted Hajaris from SEA, CTU president Marilyn Stewart from UPC, CTU Treasurer Linda Porter from CSDU and King High School teacher Karen Lewis from CORE presented their 3 minute opening statements in that order before fielding questions ranging from the current budget crisis to contract negotiations. The two candidates who vowed to fight the administration with all their might were Lynch and Lewis. "When they first closed three schools in 2003 we protested," Lynch said. "When Huberman tried to ban us from the campaigning, we went to court to fight and won. We're not afraid to fight Huberman." Lewis said the stakes are high in this election. Large passionate applause followed Lewis and Lynch's opening statements. Ted Hajiharis, above left, is candidate for President of the Chicago Teachers Union on the slate of the "School Employee Alliance" (SEA) caucus. 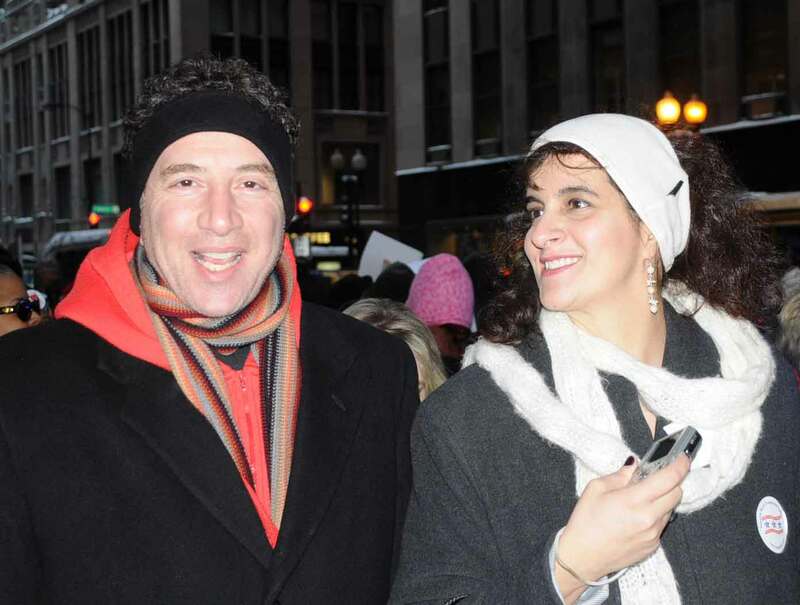 Above, Hajiharis picketed the Chicago Board of Education's headquarters at 125 S. Clark St. on February 10, 2010, with fellow candidate Pam Touras (above right). Hajiharis is currently on leave from his teaching job, while working as a CTU field rep. When he became a candidate, he took a leave from his CTU job, as required by the employment contracts of the CTU field reps. Substance photo by George N. Schmidt.Ted Hajaharis, of the SEA caucus, focused on his credentials as a CTU field rep who has filed over 200 grievances and knows the importance of fighting for a good contract. He sounded polished, like the others, when he stressed in his opening statement the need for change and to stop the infighting between all the different factions in the union. "The past three (CTU) presidents have negotiated unreasonably long contracts," he said. "We are at a crossroads. The three most important points are 1) the contract, 2) unify the caucuses and 3) lobby our lawmakers. (CTU Chief of Administration) John Ostenburg and this union are tied to machine politics." The tables were turned on the union president. Candidates Hajaharis and Porter were part of a vocal UPC crowd at the last candidates forum three years ago, when they cheered madly for Stewart and booed and jeered Lynch, the only candidate who ran against Stewart in the 2007 election. Stewart narrowly defeated Lynch, who was then CTU president, in 2004, in the runoff in June 2004. Stewart again defeated Lynch and PACT in May 2007 in a two-way race. At the time of the 2007 election, both Hajiharis and CTU Treasurer Linda Porter were part of the United Progressive Caucus (UPC), which is now running Marilyn Stewart against two former UPC members, in addition to the CORE and PACT candidates. This time Stewart had to defend herself and her record against four opponents. Her message was that all the other candidates are promising "pie in the sky" — things that they could never deliver, while she is the one who can get things done. Stewart also continued her attack on Lynch's last contract that she said gave FTBs (full time basis teachers) no due process because the principal could fire them without giving a reason — a key contract point that doomed Lynch's 2004 re-election, according to close observers. Although Stewart still could get an applause line out of the charges, she was never challenged on the fact that the contract she was criticizing had been negotiated in 2003, and that she had negotiated one in 2007 that could have eliminated the problem, but didn't. The candidate who failed to generate any applause in the opening round was the CSDU (Caucus for a Strong Democratic Union) candidate Linda Porter. Her short opening speech seemed to catch delegates and even the moderator Paul Green off guard, who promptly told her she still had two minutes to speak. 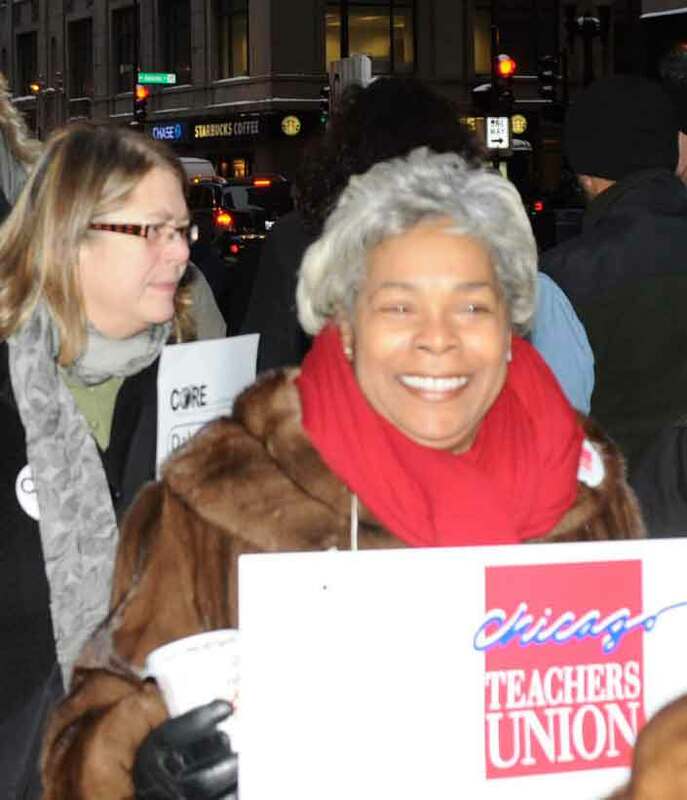 Chicago Teachers Union Treasurer and former UPC leader Linda Porter (above, at the union protest against school closings on February 10, 2010, at CPS headquarters in Chicago) is now a candidate for CTU President on the slate of the Caucus for a Strong Democratic Union (CSDU). Substance photo by George N. Schmidt. "We've seen how inexperienced leadership has ruined us," Porter said. "We have lots of experience. Thank you." Throughout the debate, Porter's responses were the briefest. At first, this seemed to be a good tactic, but as the debate went on (for a total of more than 80 minutes), many delegates expressed disappointment or anger that Porter was not more detailed in her remarks and in her answers. After the opening statements, the next round was a series of questions that each candidate had 30 seconds to answer. The first question was how to deal with the current funding crisis. Lynch said the funding issue resides with "King Richard" — or Mayor Daley. She cited the time House Speaker Mike Madigan told Lynch he couldn't help with the 5 + 5 bill that would allow teachers to retire early because Daley didn't support it. "The man behind the curtain is on the fifth floor of City Hall," Lynch said. "We don't even get reports of where our funding of politicians is going." Hajaharis said the solution is to elect someone who understands the contract. He was the only candidate who said he is willing to go back to the negotiating table “something Daley and his schools chief Ron Huberman are demanding from the teachers union to make concessions,“ which drew loud boos. CORE's Karen Lewis said the key to union power is the reawakening the 30,000 members of the Chicago Teachers Union to fight the cuts in school funding. She also said the tax monies taken from the schools and put in TIF funds should be restored to the schools. "We are the largest union, and we are not using the power behind our union," Lewis said. "We need to close our pocket books to the politicians who work against us." King High School chemistry teacher Karen Lewis (above left) is running for CTU President on the slate of the Caucus Or Rank and file Educators (CORE) and drew last place for the debate and on the May 21 ballot before the April 7 debate. Above, Lewis spoke to CORE members during a candidate's presentation for CORE members on January 12, 2009. Seated beside Lewis (above right) is CORE candidate for CTU vice president Jesse Sharkey, who is delegate from Senn High School. Substance photo by George N. Schmidt.In terms of questions about the contract, several candidates said the contract could be opened in an emergency, but it would require CPS opening its books, something Lynch said Daley and Huberman would be loath to do — "to show where the bodies are buried." Stewart was able to generate some laughs during the intense debate when she said Porter didn't even bother to show up on weekends during the contract negotiations because she doesn't work on the weekends. Later, several delegates pointed out that during the final weeks of the 2007 contract negotiations, Stewart had excluded all of the other officers from the negotiations, although Dallas said he insisted on being there. Hajaharis constantly cited specific articles in the contract to beware of, noting the current contract is a "sell out" because the protection for tenured teachers is gone. Lynch said you have to "relentlessly" enforce the contract. Lewis noted that the contract protections are still suspect, citing the case of Michael Brunson, who is the current CORE candidate for recording secretary and a displaced teacher. 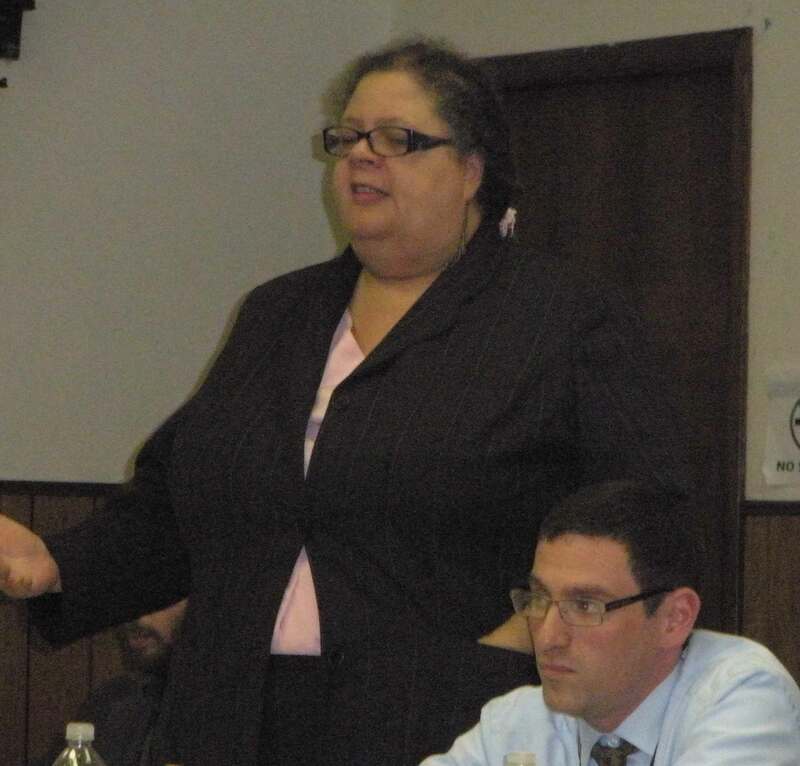 Lewis said that Bruncon lost his job at Aldridge Elementary School, even though he had tenure, because his principal said he did not have a reading endorsement. Brunson is currently fighting to be reinstated, saying his dismissal was a political reason because he was a delegate who protected his members against the administration. The next question focused on who is best qualified to be president of the Chicago Teachers Union. Stewart said she has twice the experience of any of the candidates here because she has served two terms as president, to which Lewis retorted, "Where has experience gotten us — charter explosion, union infighting, and 6,000 union teachers jobs gone...“ she said. "That experience doesn't work for me," Lewis concluded, to applause. Lynch cited her contract that included the highest raise in 20 years, only two schools closed during her tenure, and principal evaluations. Lewis focused on her outsider status. “All the other candidates have served in a union administration,“ said Lewis, who has over 20 years teaching experience and is involved with a caucus that she said has fought the Renaissance Plan to close schools. She said that CORE's fights against school closings in 2009 and 2010 resulted in 12 schools being taken off the closure list. Lynch said with a smile that the word "tenacity" would best describe why she is most qualified to be president because she ran three times for president before getting elected, and a total of five times. The next question was how would each candidate deal with the Mayor. Stewart said it would work to the mayor's advantage to have an inexperienced candidate run the union, Porter defended the mayor saying he puts on his pants like any other person, and Hajaharis noted the mayor does not fear the union and said "we don't negotiate with the mayor (although he said earlier he is open to sitting down to re-negotiate the current teachers' contract). Lewis said you need to build up your army first and then it will be up to the members to decide to go on strike, to which Lynch agreed, noting that the union has no strike fund and lost millions of dollars after her tenure. The current and former UPC presidential candidates all stressed their concern with a strike “arguably the most important weapon the teachers have in order to successfully negotiate anything,“ with Hajaharis summing it up: "The Board might welcome a work stoppage and hurt us. We like the opportunity to go to the table,“ he said, repeating, "we can negotiate at the table. 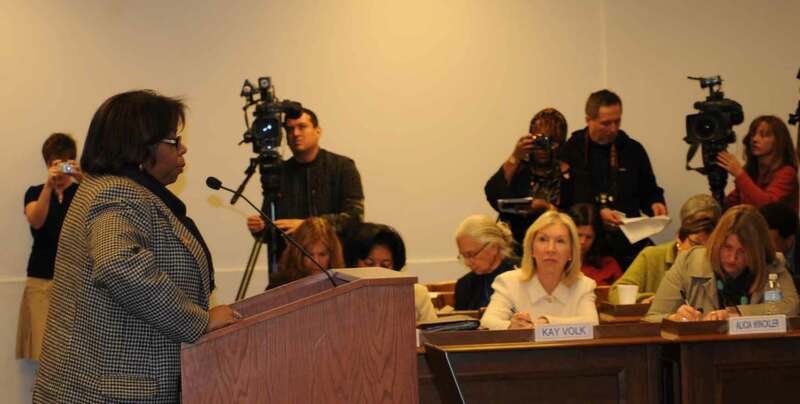 " However, CTU Treasurer Porter did note that the last strike in 1987 resulted in the Board paying 7% into the teachers' pension fund. Lewis drew big applause when she said it is the union's job to come out in big numbers to stop privatization and protect public education and to protest against the onslaught of excessive testing that hurts the children. The candidate who was able to avoid most of the mudslinging was Lewis. However, Lewis and CORE — the new teachers' caucus that has been actively involved in fighting school closures for the last two years — was attacked once by Stewart. Stewart asked where was CORE in 2002, 2003, 2004, etc. And Stewart once again defended her strategy to work closely with the Daley Administration and the Renaissance Plan by stating "charter schools are not our enemy. " This statement drew a number of boos from teachers, similar to Hajaharis's statement that he would look to re-negotiate the current contract. Hajaharis also said the mayor will not stop closing schools, so the union needs to demand that they open only performance schools which are still under the union. CSDU's Porter hit a nerve among the teachers at the end of the forum when she quoted Jackie Vaughn in her closing statement "Whatever we'll do, we'll do it together." One elementary school delegate said the candidate's forum was wonderful and informative and she wished she could take the best elements from each candidate and wrap them up into one. Unfortunately, the Chicago Teachers Union barred anyone from videotaping the debate, and also refused to allow delegates and union members (who can attend House meetings as "visitors", from taking photographs during the House meetings, so what took place at the April 7 debate will be reported to the union's 30,000 members through the delegates who attended the meeting, or here at SubstanceNews. [Editor's Note: The Chicago Teachers Union refused to allow the press or union members to photograph the debate so Substance has used photographs from previous events for this article. Substance asked Chicago Teachers Union Chief of Staff John Ostenburg to provide us with photographs of the debate itself, since a union photographer was taking photographs during the event, but Ostenburg never returned our phone call messages. Substance told Osteburg that the photos would receive full credit when published at www.substancenews.net and if published in the print edition. No video of the event was made, despite requests from union members that one be made available on the CTU Website (www.ctunet.com). Substance is working on compiling a complete transcript of the debate from the notes of our reporters who are also members of the House of Delegates, but that had not been completed as of midnight, April 10, 2010. CTU officials have also refused repeatedly to publish full transcripts of the CTU House of Delegates meetings at the CTU Web site. CTU officials and Ostenburg have also refused to publish back issues of the Chicago Union Teacher, the union's official newspaper, despite the fact that a complete set of back issues is in Ostenburg's office at the CTU's Merchandise Mart offices. ].